Phoenix are one of Ireland’s premier cover and wedding bands, comprising of five accomplished musicians, who between them have three lead singers, electric guitar, bass guitar, keyboards, percussion and drums. The band plays a vast repertoire of music from every genre and era, ensuring that they always entertain every crowd at any venue or event. Depending on the wedding or event, Phoenix will tailor a set list accordingly, which can include songs from artists as diverse as Ed Sheeran, Bon Jovi, Olly Murs, The Beatles, Picture This, Kings Of Leon, AC/DC, Dolly Parton, Bruno Mars, Elvis, Depeche Mode, The Killers, Joe Dolan, Tina Turner, Guns and Roses, The Monkeys, Abba, Michael Buble, and lots more. The band plays favorites from the 60’s, 70’s, 80’s, 90’s and 00’s, right through to the most up to date chart topping hits. 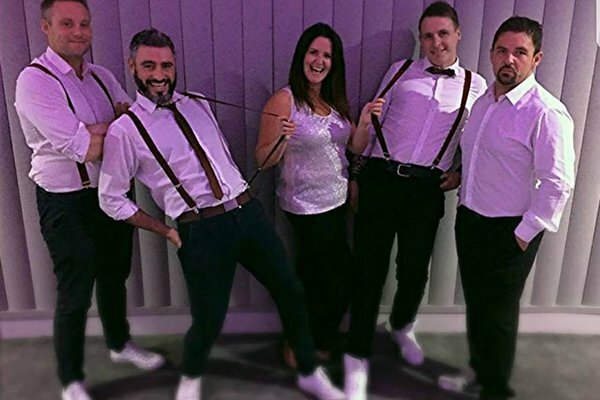 They perform everything from 90’s dance hits to classic rock songs, dance floor fillers to waltzes and jives, and rock’n’roll to slow songs. With such a versatile and hit-filled set list, an electric on-stage energy and presence, top of the range PA and lighting, and an ever-growing army of fans and followers, Phoenix always live up to their reputation as one of Ireland’s Premier Party Bands. To check availability and fees for Phoenix for your wedding or event, simply complete the form below, and we will be in touch with a custom quote within 24 hours.